Probably of the Seljuk Sultanate of Iconium (which was subject to the Khanate of Persia). 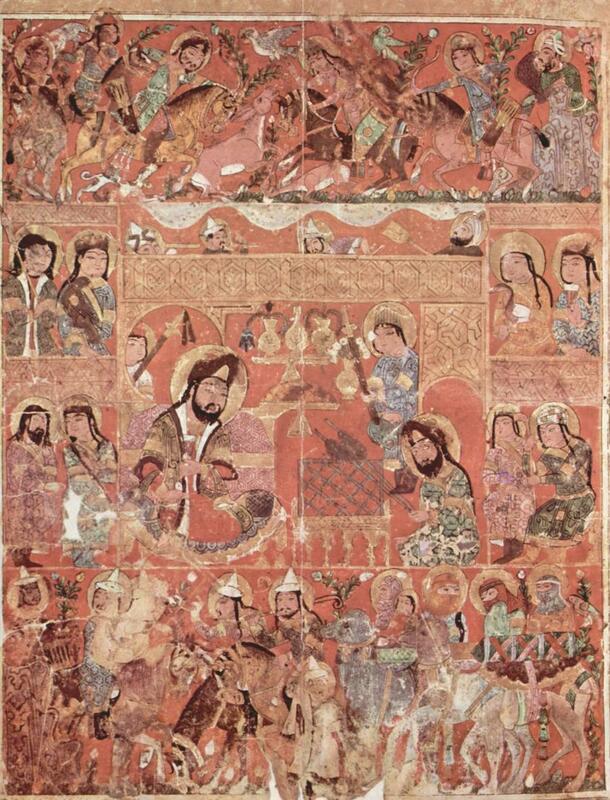 A larger image of the Frontis, Kitab al-Diryaq (the Book of Antidotes) by Pseudo-Gallen. Kitab al-Diryaq (the Book of Antidotes) by Pseudo-Gallen, probably from Mosul northern Iraq, c1250. MS. AF 10, folio 1r, Nationalbibliothek, Vienna, Austria. Kitab al Tiryaq, 'Book of Antidotes'. Made in Mosul c. AD 1250. Huntsmen career along the top register while a caravan fills the lower panel. In the middle a prince watches a man cook kebabs. pp.453-4: Oddly enough there seem to be more illustrations of mamluk horse-archers from the later Ayyubid eras, in the 13th century, than from the days of Salah ad Din himself. Their equipment would appear to have been fairly standardized, with a minority wearing heavy armour and riding horses possibly with bards and chanfrons (Figs. 129, 291, 300, 304, 307, 308 and 651).